But the iPhone has been something truly remarkable from the start; it redefined the smartphone market almost overnight upon its arrival in 2007. Having done so, however, Apple has found it increasingly harder to stay ahead of Android-based rivals, who have mimicked features in iOS and even moved ahead of Apple in some areas. Microsoft, on the other hand, entered the smartphone market late, leaving it far behind the competition. At WWDC, Apple CEO Tim Cook called iOS 7 "the biggest change to iOS since the introduction of iPhone, [with] a stunning new user interface." I couldn't agree more that it is a massive change, except that the "stunning" UI leaves a bad taste in my mouth. My first impression was that iOS 7 looks like the love child of Android and Windows; it is an unpleasant departure from Apple's innovative design ideas. To begin with, the lock screen no longer includes the "slide to unlock" switch, which would not bother me had Apple given the lock screen a face-lift. While sporting a cleaner digital clock, the style looks oddly similar to what you see on an Android screen. At first, I wondered whether Apple had left something out or was joking, just as it did during the keynote speech in announcing OS X "Sea Lion." Without the unlock switch -- it's been a part of every iOS until now -- the screen looks naked; all you see are the words "slide to unlock" above an up arrow, which can only cause confusion among newer iOS users. This is far away from Ive's statement about "bringing order to complexity;" this change, while it seems small, will most definitely bring complexity to order. As a former Apple Store employee, I can tell you that this one change alone will prompt a lot questions from iPhone users about how to unlock their screen properly. And that's before they even begin using iOS 7. Another addition coming to iOS 7 is more useful: live multitasking, which allows a user to swap between live, updated apps instead of pausing apps when they're not in use. I do think the new feature looks nice, but it's less than I would expect of Apple. Although multitasking appears to work similarly on both iOS and Android, Apple did switch things up slightly, since there's no vertical multitasking in iOS 7 (except to quit apps). Horizontal is apparently the new cool. Other than the fact that iOS shows the user's home screen background behind the multitasking apps (as opposed to the dark translucent background Android users see), everything else essentially appears to be the same between the two. Given that this is major new feature, this is an area where Apple should want to put some visual difference between it and Android. How about a pinch function to close out of multitask view and go back to your last used app? Or you could do the same thing with just a tap on the wallpaper. Given Apple's obvious desire to make the overall UI "fluid," this is a natural area for Apple to showcase what it can do. As others have noted, the rest of iOS 7 just seems very flat and very white, with apps and icons presenting a mixed bag of the good and not-so-good. The Calendar, Photos and Newsstand icons all waste a possibly beautiful background space with a simplistic white fill. The Photos app logo does not scream "photos" to me, but looks instead like it belongs to a Paint-type application. Then there are the apps themselves. There are many welcome features; for instance, Safari now supports multiple tabs rather than having an eight-page limit, which shows Apple is playing a bit of catch-up to Chrome for Android. The Weather app is also improved, featuring an amazing new look with animated weather backgrounds. But when I got to Mail, I had to do a double take. Looking at the app itself is like looking at something from Microsoft Office 2013 for Windows. In iOS 7, Mail really looks like a watered-down version of Microsoft Outlook. They both sport a blue-on-white theme, with very basic wireframe icons, that -- while different from iOS 6 -- are too similar to Outlook. I honestly wondered whether Apple and Microsoft had secretly linked software development labs. Enterprise users, this might be a big plus for you if you like Microsoft design. The Messages app has also been given a UI overhaul, though not necessarily for the better. Overall, Messages now sports a flat design - again with the Microsoft Office look. And messages or texts now show up with white text against a green or blue background. Text fades together, making it harder to read. And something is still missing: the ability to delete multiple messages at one time, which seems like a fairly common-sense feature, especially since that's something you can already do in the Mail app. Finally, we come to photos and the Camera app. The camera is possibly the most important feature for many iPhone users, thanks to apps like Instagram, Facebook and Twitter. I would argue that the hardware in the iPhone is usually better than on most Android devices, but Android offers more camera control options than iOS. With that in mind, Apple has added filters that you can apply to photos you take with the iPhone. A year or two ago, they would have been a big deal. Now, they feel like last-minute changes made to compete with Android for camera usage. I applaud the inclusion of filters, but I want more, such as color correction, or the ability to do on-the-fly editing of faces, as you can do in Android. Apple is still catching up in this department, though I doubt that this will be a deal breaker for iPhone users. Having said all this, let me be clear: I love Apple; I own enough Apple stuff to prove it. I only hope that iOS 7 will change drastically before its final release to give people more UI options beyond "white" and "flat." 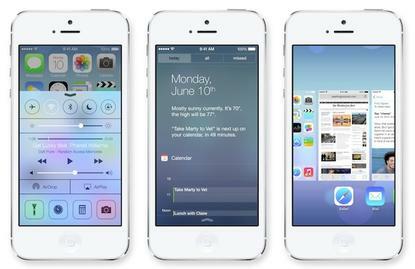 The look of iOS 7 we've been shown so far has very little that's really "Apple" about it. AT WWDC, Ive said: "We have always thought of design as being so much more than the way something looks." I partially agree: iOS is still a very strong OS. However, the current design of iOS 7 makes me worry about Apple straying from its core culture and beliefs. I want Apple to be leading, not following. Alex Burinskiy is a Technical Analyst at IDG, formerly an Apple Store Genius of 4 years, who has worked with Apple products for 8 years, ranging from personal to enterprise levels.